Donald Trump isn't doing amazingly well at the moment. In the wake of a series of damning reports about his attitude towards women (and gender politics in general) and his increasingly childish behaviour during the live debates, it looks like the storm of insanity is finally starting to clear. Well, sort of. Even if Trump's chances of claiming the White House have plummeted, he is still prime social media fodder for both supporters and detractors. The sheer volume of Trump related material incited a kind of unspoken agreement here that we wouldn't cover any of it unless it was interesting enough to counterbalance the free publicity we'd be giving him in the process. In this case, the publicity side of things doesn't really seem to matter anymore, and this is certainly interesting enough to write about. Currently, Trump is being shadowed by an evil twin, a Twitter-bot that goes by the name of DeepDrumpf (Drumpf is Donald Trump's actual surname, his family had it changed when they arrived in the States). 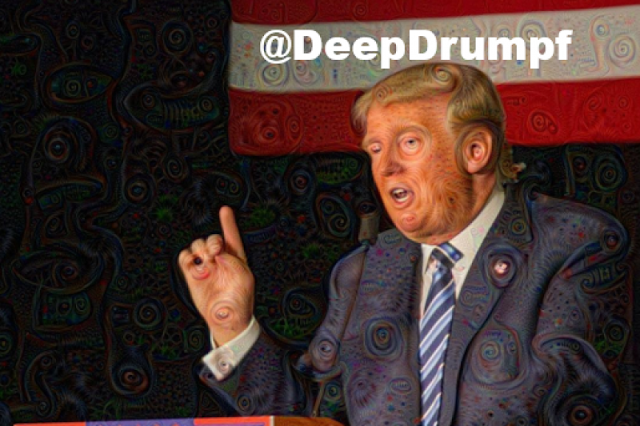 As the name suggests, DeepDrumpf is powered by deep learning AI algorithms, and he uses them to mine Donald Trump's actual speech transcripts in order to imitate his rhetoric. The result is a slightly more exaggerated, madcap iteration of the man himself, offering to supply every American with "a solid gold nuclear weapon", or bring 180,000 immigrants "to slaughter", "especially women". This darkly amusing chatterbox is serving two purposes - to make light of Trump's increasingly awful campaign, and to raise money. Indeed, a few days after the leaked recording of Trump on the bus went live, DeepDrumpf suddenly had a fundraising page. Was he running for president himself? No, in fact the page is raising money for GirlsWhoCode, who are trying to remove the glass ceiling in the computer science industry. It might seem random, but it's actually rather apt. Not only was DeepDrumpf developed by an MIT researcher, Bradley Hayes, but can you think of any cause which would make Trump more angry and/or confused? At present, DeepDrumpf has 26.7 thousand followers, and the GoFundMe page has raised over $1,000. The goal is 25k, and the election itself is still weeks away, so hopefully by then some good will have actually come out the Drumpf name, something to make up for all the stupidity and manipulation of the past year. Small victories.